Reporter covering the green technology space, with a particular focus on smart grid, demand response, energy storage, renewable energy and technology to integrate distributed, intermittent green energy into the grid. 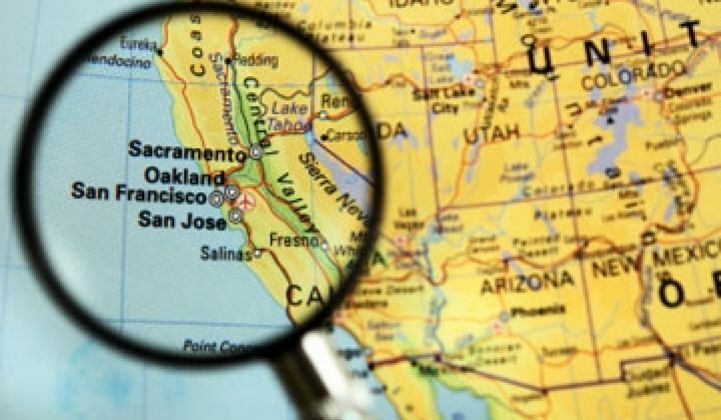 In California, where rooftop solar PV, distributed energy storage and energy-engaged consumers are becoming an increasingly important part of the grid mix, state regulators and utilities are starting to think about how these grid-edge systems will work together for the benefit of the grid, the environment and ratepayers alike. This week, the California Public Utilities Commission plans to open a new proceeding to decide how the state will take on this herculean effort (PDF). The goal is to create a process for maintaining and growing the distribution grid -- the part of the grid that delivers energy to end customers -- that takes all the distributed energy resources coming onto the grid into account. CPUC’s new Order Instituting Rulemaking is the first step in a process started by AB 327, a law passed by the California legislature last year that makes major changes to state energy policies. While AB 327’s electricity tariff and net metering rule changes have gotten the most attention, the law also sets a June 2015 deadline for the state’s big three utilities -- Pacific Gas & Electric, Southern California Edison and San Diego Gas & Electric -- to create new models for planning distribution grid investments that “integrate cost-effective distributed energy resources” into their models. California’s big three utilities spend roughly $6 billion per year on distribution grid investments, via Distribution Resources Plan (DRP) proposals submitted to the CPUC. But today’s DRPs have no mechanisms to determine how lots of rooftop solar, customer-sited or grid-located energy storage, and demand response will impact that future. That’s a problem, because California could see 15 gigawatts of these distributed energy resources (DERs) come on-line this decade, including 12 gigawatts of distributed solar, 1 gigawatt of grid-scale energy storage, and another gigawatt of demand response. Leave these DERs out of the equation, and utilities have no way to know whether or not their $6 billion annual investments are going to support a DER-rich grid. I spoke with Tony Brunello, executive director of the Greentech Leadership Group, a nonprofit that worked with De Martini and Caltech’s Resnick Institute to create the white paper, to learn how the CPUC, utilities and key stakeholders from DER industries like solar and energy storage are approaching the challenge. “If we’re going to have $6 billion a year spent on distribution infrastructure, we know we need to see more improvements than what have been inserted into the utilities’ smart grid plans” to date, Brunello said. Brunello will join me for a fireside chat on the state of energy system analytics at Greentech Media’s Soft Grid 2014 conference on Sept. 10-11 in Menlo Park, California. Sign up before August 16, when prices increase. That’s not to say that California’s utilities are shirking smart grid investments, he noted. 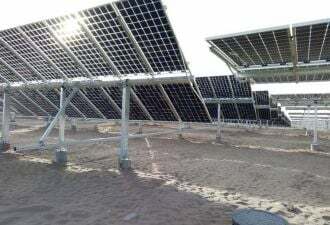 Rather, it’s an acknowledgement that those investments have been made in relative isolation from concurrent state policies on solar power, energy storage, demand response and other DER-related issues, he said. At the same time, California’s grid and energy policies have concentrated on the effects they will have on the system as a whole, not on individual sections of the distribution grid. That makes sense given the current regulatory regime that separates transmission grids, the realm of state grid operator CAISO and distribution grids, which are under the authority of individual utilities. AB 327 takes a number of concepts used on the transmission grid to the distribution grid, including the idea of “optimal locations” and “specific locational values” of DERs of all types. It also requires the creation of programs, incentives and tariffs to encourage actors to deploy them where they provide the most value. 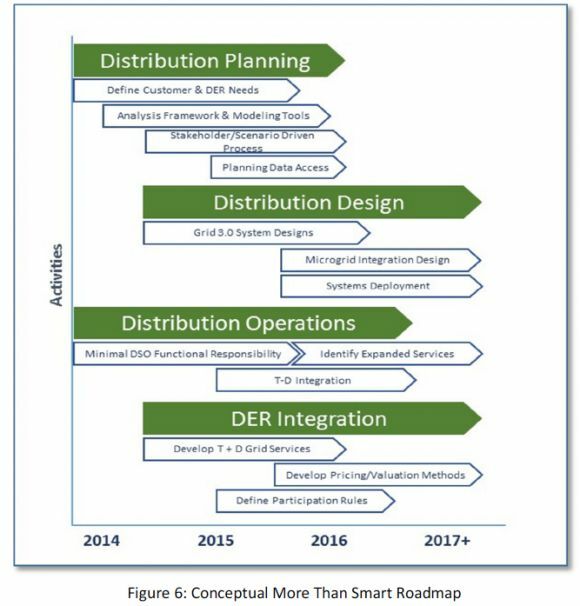 De Martini’s white paper lays out a prospective four-step process for moving from today’s status quo to a DER-integrated grid future, along with the likely timelines for achieving the different stages of these four steps, as shown in the following figure. The second step will be for California’s utilities to “move toward an open, flexible and node-friendly network system,” De Martini writes. New smart grid technology developments, such as distribution operations “hubs” or “transactive energy” constructs, could play a role in creating this “grid-as-network” architecture for distribution grids. The third step involves expanding the roles that California’s utilities are allowed to play in creating mechanisms and markets for DERs to offer their various values to the grid, De Martini writes. That’s going to require some complex changes to how utilities interact with customers and third-party owners of DERs, and how those aggregations of distributed resources are integrated with the state’s broader grid operations. That includes some of what De Martini calls “minimal functional responsibilities” that distribution grid operators will need to take on, such as “managing distributed reliability services involving many types of DERs and independent microgrids” and “providing situational awareness involving forecasting, real-time measurement and reconciliation of net load, dispatchable DERs, and real and reactive power flows” where the distribution grid connects with the transmission grid. The final step involves coming up with markets and programs that “create opportunities for qualified DERs to contribute to the optimization and operation of markets and the grid, and reduce the barriers and costs to participate,” De Martini writes. In simple terms, this is the step in which the work of the previous three stages is manifested in real-world interactions between utilities, customer-owned DERs, third-party aggregators and providers of DER installations and services, and potentially other actors. From now through 2017, the goal is to “help develop the market, help define the parameters, and create performance guidelines out of whole cloth. I think we’re at the first stage in developing those services and defining which ones are most valuable to the ISO,” said Brunello. 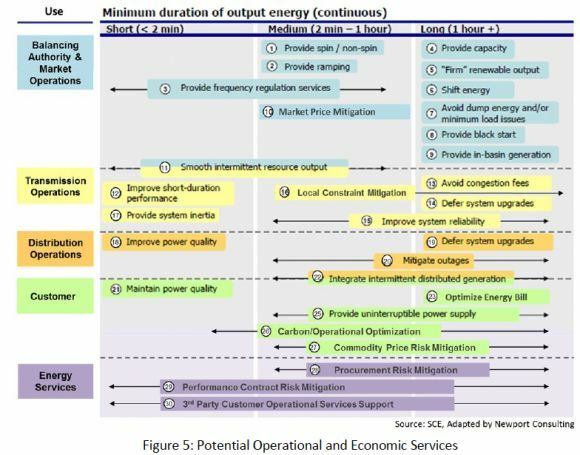 To illustrate the potential for DERs, De Martini’s white paper includes a chart that describes 30 different ways in which they could provide valuable grid services, which is shown below. Strict rules for guaranteeing the performance of distributed assets will be an important part of this, he writes. But making the system transparent for consumers will be equally important so they can make informed decisions about what they’re willing to provide to the grid, and how they’re going to be compensated for it. CPUC’s Order Instituting Rulemaking notes that this entire process is “not a straightforward undertaking” -- which is a major understatement. To learn how to effectively manage, analyze and take action on the data generated by grid networks, join Greentech Media at The Soft Grid: Data, Analytics and the Software-Defined Utility conference on September 10-11, 2014 in Menlo Park, Calif. Look forward to seeing you there!